Hell In The Club are no strangers to Sleaze Roxx and its readers with the group’s debut album Let the Games Begin charting on both Sleaze Roxx’s Top Ten Albums of 2011 and its Readers’ Top 20 Albums of the same year while the band’s sophomore effort Devil On My Shoulder charted at number 14 on Sleaze Roxx Readers’ Top 20 Albums of 2014. 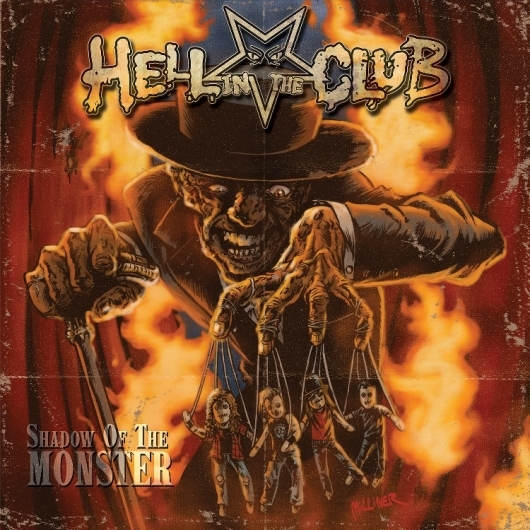 Shadow of the Monster is Hell In The Club‘s third album which sees the group sticking to a hard rock format with twinges of uniqueness. In essence, Hell In The Club blow through ten tracks in an explosive 42 minutes. Shadow of the Monster is something a little different from Hell In The Club‘s first two records. It is more mature, and generally less aggressive lyrically than previous albums. The group’s debut album Let The Games Begin featured the song “Raise Your Drinking Glass” which is still one of my favourite party songs. 2014’s Devil On My Shoulder had “Pole Dancer” and “Save Me” as great rock tunes. I’m not hearing anything quite so bold and blustery as that on Shadow Of The Monster, and that’s alright too. Shadow still has its rock going for it. Let’s start with the mid-tempo song “Naked.” It’s a pretty little track with pleasant guitars and absolutely nothing offensive about it. Good — that’s out of the way. Every other song on this album is hair flying rock. I’m thinking specifically of Skid Row or Guns N’ Roses inspired “Try Me Hate Me” or CrashDiet on lead off track “Dance!” “Enjoy the Ride” is Winger-like with a powerful chorus. A little blues, a bit of rock, a bit of sleaze defines “Hell Sweet Hell.” Probably the most unique track is “Le Cirque des Horreurs” (Circus of Horrors) which starts with a minute’s worth of quirky circus carnaval type music before ripping into a killer rock song.